A recent survey found that 83 percent of Americans expect companies to accomplish their business goals while improving society and the environment. Now a free sustainability report from Evolve Recycling documents how recycling at your company is reducing its carbon footprint. The sustainability report measures everything you recycle in terms of reduced greenhouse gasses and tonnage of reclaimed materials. 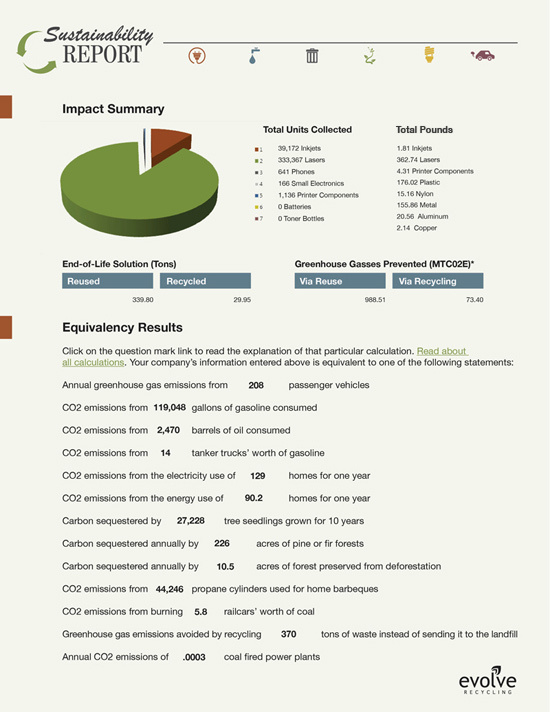 Evolve Recycling’s sustainability report demonstrates your company’s commitment to the environment. It will impress your customers and turn your competitors green with envy. **You must be registered with Evolve Recycling to receive a free report.